It's April Fools' Day and every man and his dog is trying to catch us out with their ludicrous and 'hilarious' joke product launches, but OnePlus has taken things a step further by actually putting its new device on sale. 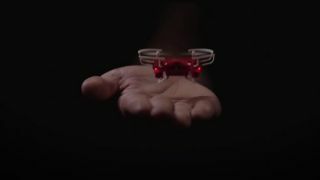 That's right, you can actually be the proud owner of the world's smallest remote-controlled drone, the OnePlus DR-1, measuring just 70mm (2.75 inches) across. Sadly you can't control the drone with your OnePlus One smartphone - you instead get a slightly clunky looking remote to orchestrate your aerial bombardment with. The DR-1 has been touted for a while by the Chinese startup, dubbing it a 'game changing' product in its teaser promotions. The game is still very much unchanged (sorry OnePlus), but it shows the firm is willing to try things outside the world of mobile. That said, we still expect its next product launch to be the OnePlus 2. It takes 20 minutes to charge the DR-1 and that will give you five to eight minutes of air time - which may not sound like a lot, but considering the size of the thing it's not bad. It can be yours for $19.99, £15.99 (around AU$25), but this is a limited edition run so you'll have to be quick. Shipping is set to take three to 15 days.